It seems like every time a car gets a complete makeover, it gets bigger and bigger. Cars that used to be in the sub-compact category are now encroaching mid-size categories. Probably the only exception that I can think of, would be the Mazda MX-5, which is lighter and smaller than the car it replaces (we’ll be reviewing that in a couple of weeks). As cars get bigger, there’s a void left and some car makers take opportunity to fill those voids with new vehicles. One such new vehicle is the Mazda CX-3, in a newly created category that could be called sub-compact CUV. The CX-3 competes against vehicles like the Honda HR-V (we reviewed that a few months back), Chevy Trax, and maybe even the Subaru XV Crosstrek. Most people looking for these types of vehicles would probably be looking at the Honda HR-V and the Mazda CX-3. These two vehicles may be similar in size but their manufacturers take a different approach when it comes to vehicle dynamics and the overall package. 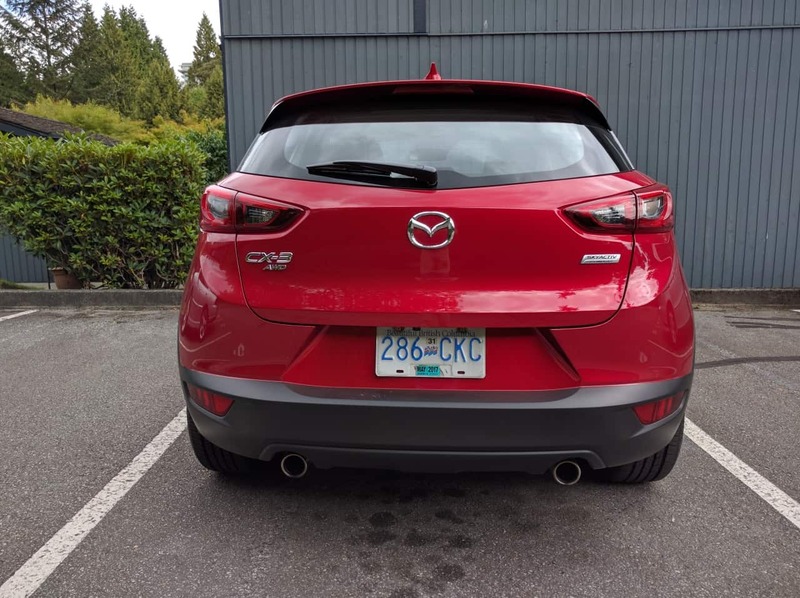 In Canada, the 2016 Mazda CX-3 is available in three trims: GX, GX, and GT. The CX-3 comes standard with FWD on the GX and GS trims, with the option to upgrade to AWD for $2,000, and the GT is offered with AWD only. There are also two add on packages, “Luxury Package” and “Technology Package”. 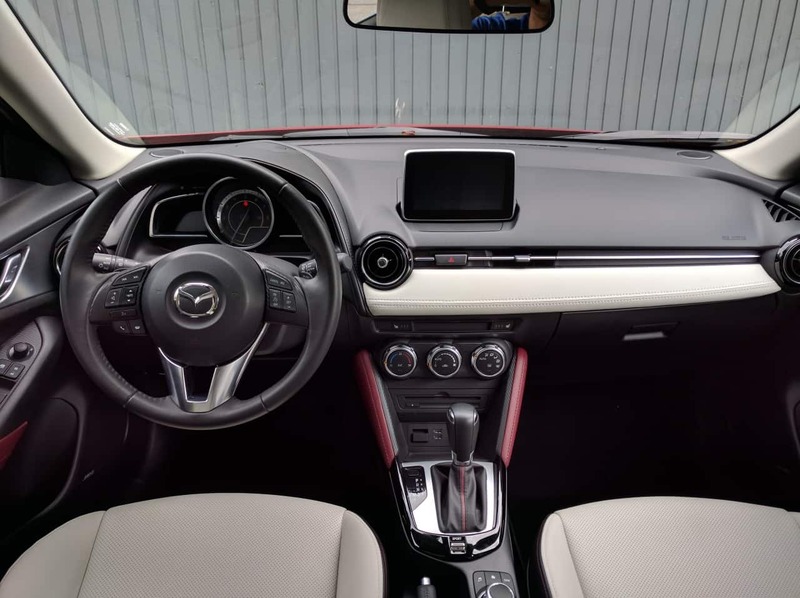 Below is a list of prices for available configurations on the 2016 Mazda CX-3. The “Luxury Package” consists of leatherette upholstery and power moon roof and the “Technology Package” with the following: Smart City Brake Support (SCBS), Blind Spot Monitoring (BSM), Rear Cross Traffic Alert (RCTA), Lane Departure Warning System (LDWS), High Beam Control (HBC), and Sirius XM satellite radio. Our test vehicle was the Mazda CX-3 GT Technology Package, with a total price of $30,795 plus Freight & PDE of $1,895. 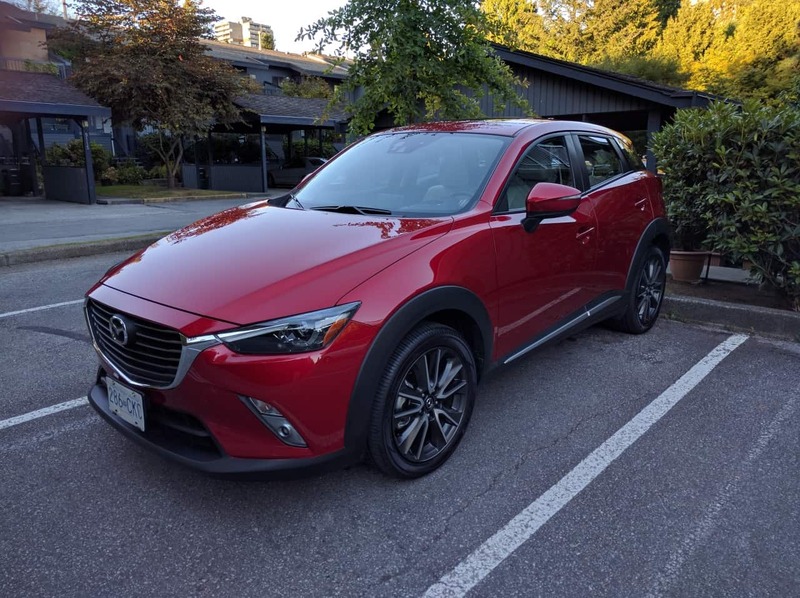 All three trims of the CX-3 come with a direct injection 2.0 liter 4-cylinder SKYACTIV engine, producing 146 horsepower at 6,000 rpm and 146 pound-feet of torque at 2,800 rpm. Power is sent to the front or all wheels via a 6-speed automatic transmission, with steering wheel mounted paddle shifters (offered only on the GT trim). 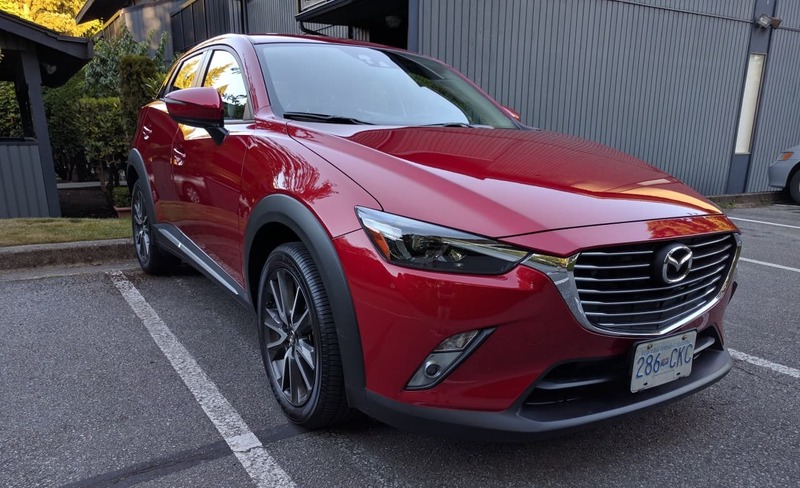 According to Mazda, FWD CX-3’s should consume 8.2/6.7 L/100 km in city/highway driving, while AWD equipped vehicles should consume 8.8/7.3 city/highway. After a week of driving the AWD equipped CX-3 GT, the on-board computer showed 8.0 L/100 km in 50/50 city/highway driving. 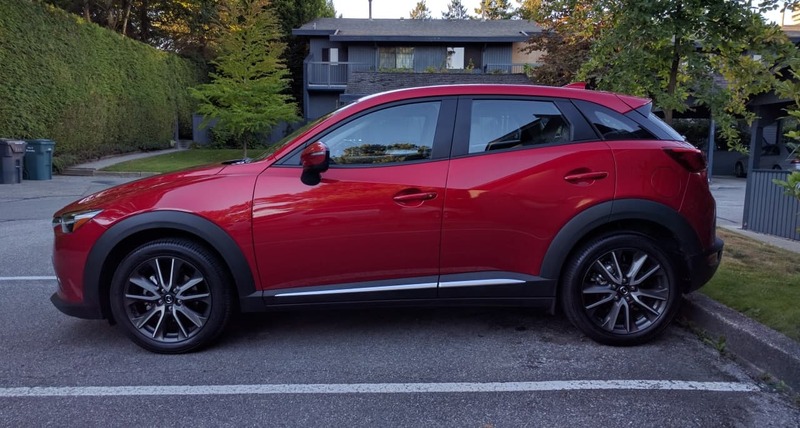 Mazda doesn’t seem to be using their “zoom-zoom” slogan any more, but they should, especially on the CX-3; it is the “zoomiest” of small CUV’s currently available. On paper, the 146 hp doesn’t seem like much power, but it’s plenty for this little “ute”. Comparing the CX-3 to the HR-V, the driving dynamics are totally different, the CX-3 feels like a sports car compared to the HR-V. 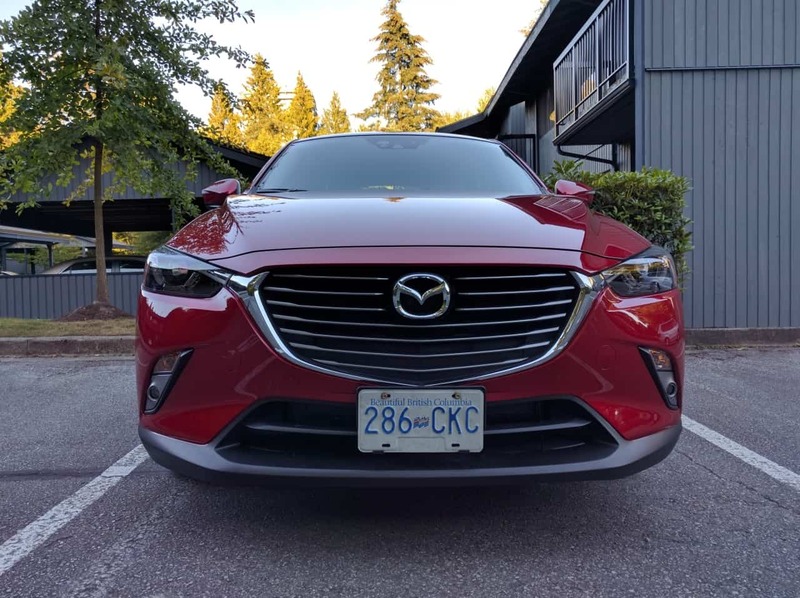 Horsepower on both vehicles is close, but the additional torque from the SKYACTIV engine and the 6-speed automatic over the HR-V’s CVT makes driving the CX-3 so much more enjoyable. I enjoyed driving the CX-3 more than the Mazda3 (which I picked up right after dropping off the CX-3, review of that coming next week), and the Mazda3 is already a pretty sporty sub-compact car. Driving around in the city is easy because of the size of this vehicle (it’s based on the Mazda2 platform). There’s plenty of power for the crowded city streets and highway driving is a breeze. The transmission is sorted out quite well, you don’t need to downshift manually to pass slower vehicles on the highway, just a little added pressure on the accelerator pedal and the transmission quickly drops a gear and you’re on your way. 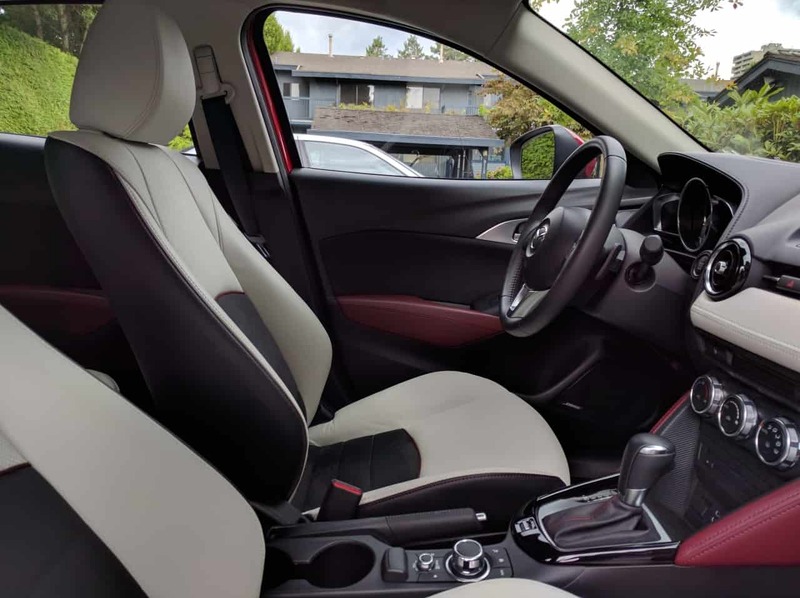 The CX-3 also comes with a “sport” mode, which makes the transmission stay in a gear longer, it adds to the sporty feel of this vehicle and the steering wheel mounted paddle shifters make things a little more fun. The suspension is also firmer compared to the HR-V, giving the CX-3 a more dynamic ride. I personally prefer a firmer suspension, but if you like a bit more of a relaxed ride, also have a look at the HR-V. The Mazda CX-3 shares the family looks from all of the new Mazda vehicles, which is based on the KODO design language. I think the design looks pretty good, there are nice sweeping lines across the body, and the front has a nice aggressive look. The GX and GS trims come with 16” wheels, while the GT trims gets sporty 18” alloy wheels. The GT trim also comes with LED headlights, taillights, and fog lights, while the lower two trims get halogen lights. The CX-3 is the sportiest looking sub-compact CUV, in my opinion. 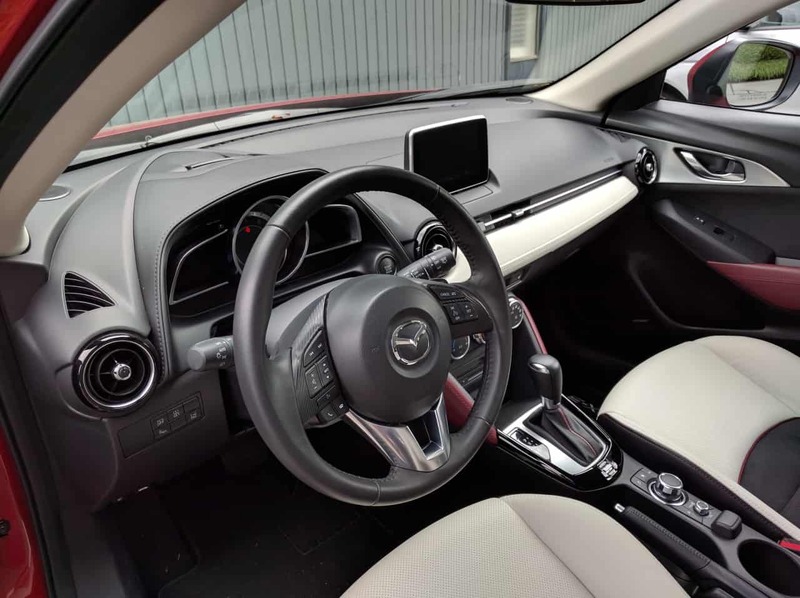 The interior on the CX-3 has a very clean layout, I’m a fan of the simple approach Mazda designers take when designing interiors on their vehicles. The interior does have lots of hard plastic, especially on the dashboard, but it doesn’t look cheap, and it comes with a thick strip of leather material running across the front of the dashboard, the same color material used on the seats. 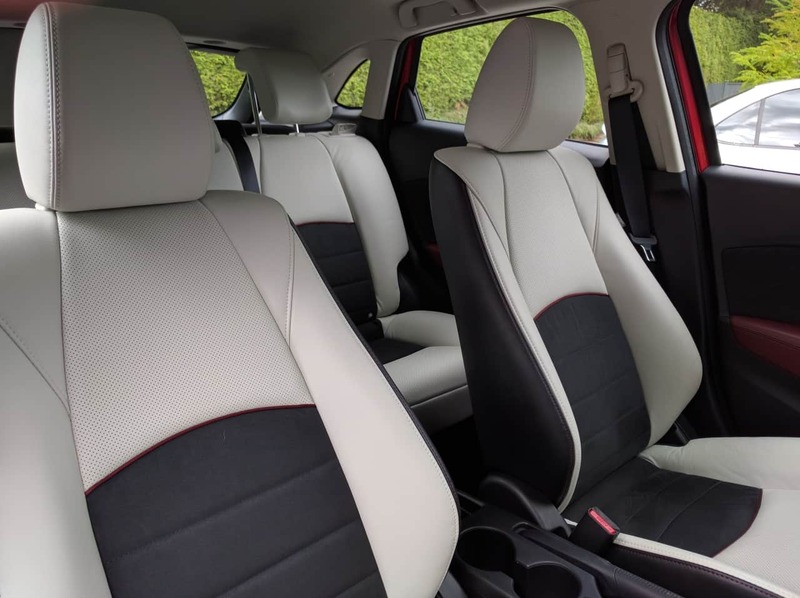 Hard plastics aside, the interior is comfortable and does have softer material on the door panels and soft padding on the outside of the vertical parts part of the center stack. I had complained about this part being hard on another vehicle by a different manufacturer recently; my right knee was much more comfortable resting against the soft material on the CX-3. The CX-3 comes with a 7” display screen for the infotainment system, this screen stick out of the dashboard, which I have complained about quite a bit in the past, but now I’ve come to accept it, as more and more manufacturers are going this route, however I would prefer a unit that’s more integrated into the dashboard. Using the infotainment system is pretty easy, it can be controlled either by touching the touchscreen or by using the knob on the center console. I really liked using this knob, it saves the touchscreen from having lots of oily fingerprints and once I got familiar with it, I didn’t need to take my eyes off the road to change between different outputs on the display screen. However, because the center console is so narrow, the knob and volume buttons have been pushed back, I personally would’ve like these to be a bit closer to the gear lever (this system is better laid out on the Mazda3). The CX-3 is also missing a center arm rest/storage compartment, I personally like to use this storage compartment over the glove compartment to throw things like sunglasses, keys etc. in because it’s closer to me and I don’t have to reach over to the glove compartment. 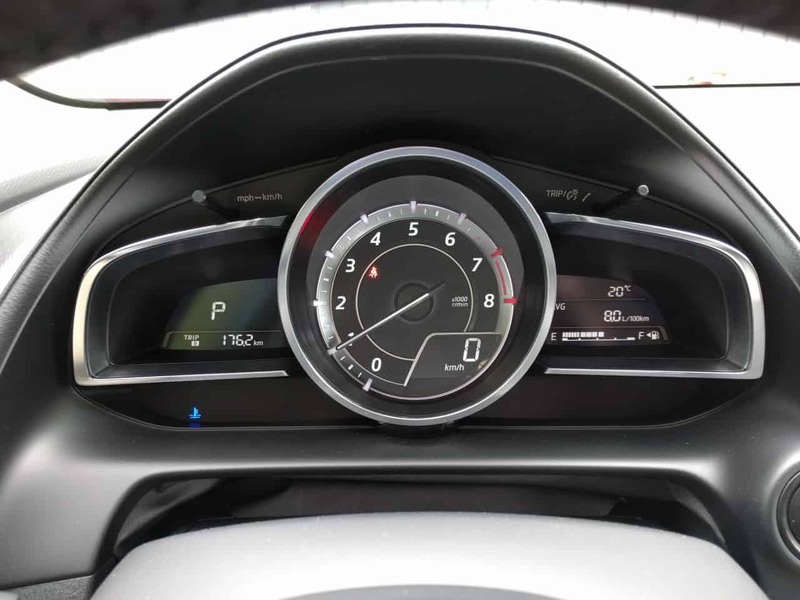 The gauge cluster on the CX-3 is pretty straight forward, featuring a large tachometer in the center with a small window for a digital speedometer, this layout is reminiscent of a sports car. Speed is also displayed on the HUD display, which is great for keeping your eyes on the road, the HUD also displays warnings when you leave your lane without signaling and shows your next turn directions when using the navigation system. The interior has a decent amount of space, it is after all based on a sub-compact car; I found there to be enough room in the front seats for my 5′ 8” frame, the rear seats might be a little tighter for taller people. I’m not sure if there is enough room for a car seat in the back and due to the aggressive lines on the exterior, the rear windows are small, making the rear a little claustrophobic, especially for children. The Mazda CX-3 is a pretty fun little vehicle, more fun than I expected. It is a small car that my not be for everyone, but it does offer a higher seating position than a hatchback, it’s available with AWD, and it’s pretty fuel efficient. It’s also sporty looking and driving it can be fun, with the available AWD, it’s also a great alternative to a hatchback, especially for Canadian winters. When I'm not reviewing the latest cars, I'm busy checking out the latest gadgets and watches by the world's best manufacturers. Cars, gadgets, and watches... that's all a man needs to get through life.